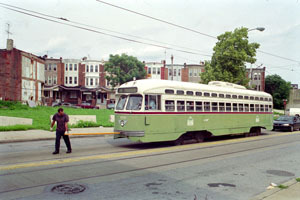 The most recent time that a trolley rolled down Germantown Avenue through Wayne Junction was on June 15, 2003. 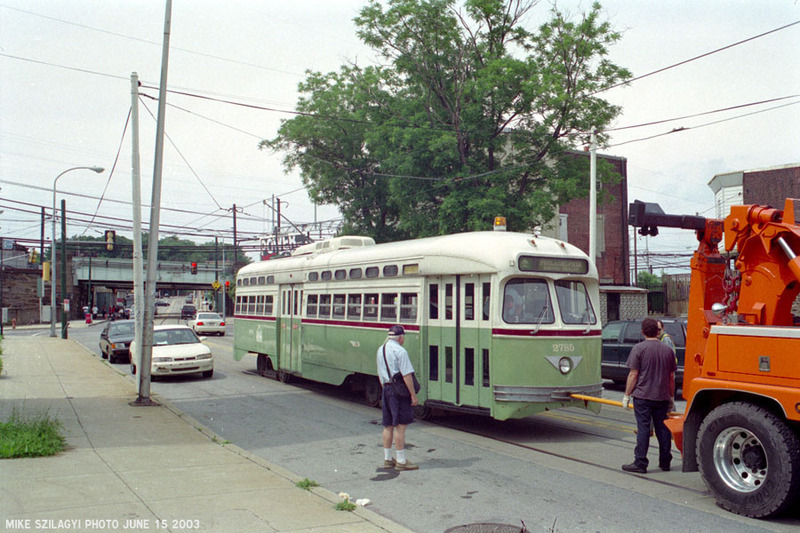 That was the last time that an Electric Streetcar Tour of historic Germantown Avenue was conducted. These tours were sponsored twice annually by Walk Philadelphia and the Historic Northwest Coalition. Because one stop on the tour, Wyck, is south of Germantown Depot, the next place the trolley could be turned around was 3 miles south at Ontario Street. SEPTA had removed the trolley wires attached to the underside of the railroad bridge over Germantown Avenue. 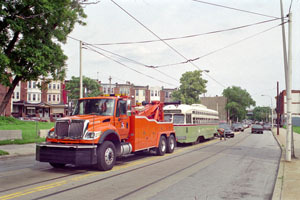 Therefore, a tow truck and a specially-fabricated draw bar had to be used to pull the trolley under the bridge. Click on these photos for larger views. 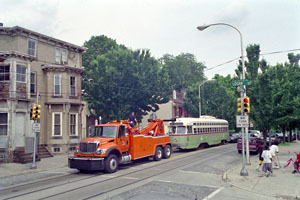 2009: The current management regime at SEPTA has NO plans to return trolleys to Route 23. Return to Philadelphia Trolley Tracks main page.